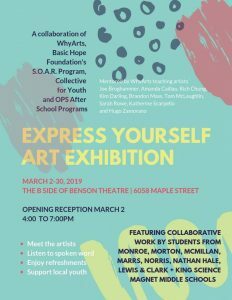 BENSON – The collaborative artwork of middle school students from throughout the metro will be on display at The B Side of Benson Theatre, 6058 Maple Street, during the month of March. The opening reception for the Express Yourself Art Exhibition is Saturday, March 2, from 4:00 to 7:00pm at B Side. The exhibition, sponsored by the Basic Hope Foundation, is a collaboration of S.O.A.R., WhyArts, Collective for Youth and Omaha Public Schools. The student work will be created in February through a series of workshops led by WhyArts faculty. The March 2 opening reception is free and open to the public. 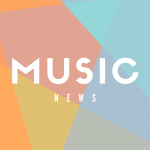 Attendees will be able to meet the artists and enjoy spoken word performances and refreshments. For more information, contact Jubenville at kim@whyartsinc.org.